Oriental Amber: The deep and calm scent of splendidly autumn-tinted maple leaves. Keynote: Persimmon, Tonka bean, Ambergris. Yume-no-Yume (translated as "The Dream of Dreams"), is a contemporary Japanese incense combined with beautiful Japanese art design. The package design reflects the four seasons in Japanese art style and depict dreamy, peaceful images. Yume-no-Yume (The Dream of Dreams) has a subtle, yet full bodied Japanese fragrance. In Japan, the flow of one season to the next is very subtle, which is why the premonition of the coming season is a very important theme in literature and paintings. In the Dream of Dreams line, these premonitions appear in the forms of flowers, plants, and animals. The images, like the seasons, are at times clear and at others fading out. This soothing incense is created especially to evoke pleasant dreams and to remind us of long forgotten memories. 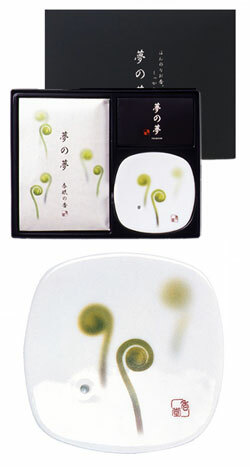 This is a gift package set which includes one package of Fiddlehead Fern (Fresh Fruity fragrance) incense and one Japanese art painted ceramic plate. This is a unique gift set of traditional design, modern shape and fragrant incense. Yume-no-Yume is Japanese for "Dream of Dreams." The beautiful fragrances of this incense together with the stylish ceramic burners and gift packaging will evoke equisite dreams and atmospheres. Nippon quality throughout, each set comes with a little booklet describing the use of the incense. Indulge yourself, your friends, and loved ones. Keynote: Blackcurrant, Raspberry, & Leaf bud of peach.